I spent this past week in Oregon on an exercise with my unit. Since we had long hours and were in the middle of nowhere, food options were limited to fast food or Dennys. I’m not really sure which is worse, but I definitely consumed more french fries in the past week than I had in the past 6 months combined and I felt so gross by the time I got home. I wanted and needed vegetables in the worst way. Fortunately, DB and I took the Bear for a visit to a local farm right before I left and bought a bundle of asparagus. 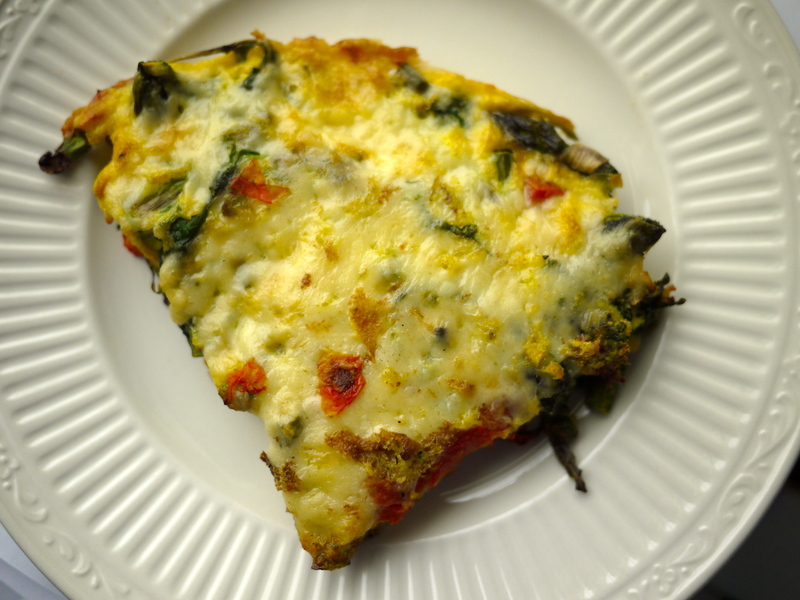 It managed to survive the week and was so delicious in what I would like to call my detox frittata. Vegetables are really they key here with the eggs and cheese serving more to bind it all together than play center stage. Feel free to play with whatever seasonal greens you have available, and add some bacon if you want something a bit heartier. – Pour in eggs and cook until almost set, but still runny on top, about 2 minutes. – Sprinkle cheese over eggs and put in oven under broiler until cheese is melted and browned, about 4-6 minutes. Carefully remove from oven, and remove frittata from frying pan. Cut into 4 wedges and serve immediately.